WordPress administrators are once again in trouble. WordPress version 4.9.3 was released earlier this week with patches for a total 34 vulnerabilities, but unfortunately, the new version broke the automatic update mechanism for millions of WordPress websites. WordPress team has now issued a new maintenance update, WordPress 4.9.4, to patch this severe bug, which WordPress admins have to install manually. "#43103-core aimed to reduce the number of API calls which get made when the auto-update cron task is run. Unfortunately, due to human error, the final commit didn't have the intended effect and instead triggers a fatal error as not all of the dependencies of find_core_auto_update() are met. For whatever reason, the fatal error was not discovered before 4.9.3's release—it was a few hours after release when discovered." 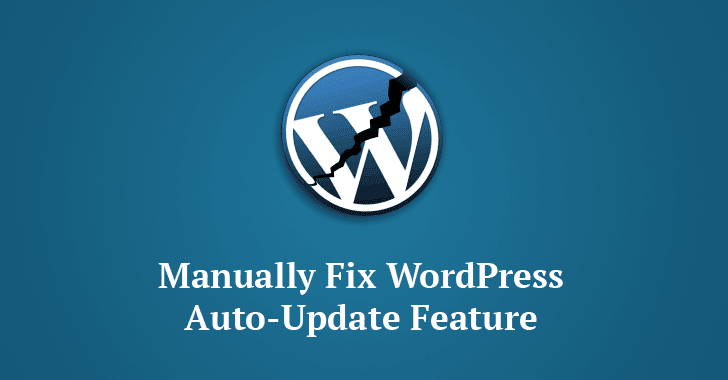 Thus, WordPress administrators are being urged to update to the latest WordPress release manually to make sure they'll be protected against future vulnerabilities. To manually update their WordPress installations, admin users can sign into their WordPress website and visit Dashboard→Updates and then click "Update Now." After the update, make sure that your core WordPress version is 4.9.4. However, not all websites being updated to the faulty update have reported seeing this bug. Some users have seen their website installed both updates (4.9.3 and 4.9.4) automatically. Since WordPress sites are often under hackers target due to its wide popularity in the content management system (CMS) market, administrators are advised to always keep their software and plugins up-to-date.